Yezidis are monotheists, believing in one God, who created the world and entrusted it into the care of seven Holy Beings, often known as Angels or heft sirr (the Seven Mysteries). Preeminent among these is Tawûsê Melek (frequently known as “Melek Taus” in English publications), the Peacock Angel. Yezidism is not an offshoot of another religion, but shows influence from the many religions. Core Yezidi cosmology has a pre-Zoroastrian Iranian origin, but Yazidism also includes elements of ancient nature-worship, as well as influences from Zoroastrianism. The seven angels are made from God’s emanation. Tawûsê Melek is often identified by Muslims and Christians with Shaitan ( Satan). Yezidis, however, believe Tawûsê Melek is not a source of evil or wickedness. They consider him to be the leader of the archangels, not a fallen angel.They are forbidden from speaking the name Shaitan. In doing so one creates an equal partner to God. God is the creator and the biggest force and it is wrong to say that there is an evil force and it is equal to God. Yazidis believe that good and evil both exist in the mind and spirit of human beings. It depends on the humans, themselves, as to which they choose. In this process, their devotion to Tawûsê Melek is essential, since it was he who was given the same choice between good and evil by God, and chose the good. community in the middle east. The concept of reincarnation is spiritually intertwined into the Yezidis from an early age. Yazidis believe that the Seven Holy Beings are periodically reincarnated in human form, called a koasasa. and sister will be waiting to assist one’s soul when one departs from this world, and act as guide for the soul through their journey in the spiritual world. suffering and pain of the world, and cried. His tears, thousands of years’ worth, fell on the fires of hell, extinguishing them. With hell extinguished and together with reincarnation, the Yezidis believe that the soul is born again and again into perfection till it merges into heaven, based on a concept which is akin to Karma. 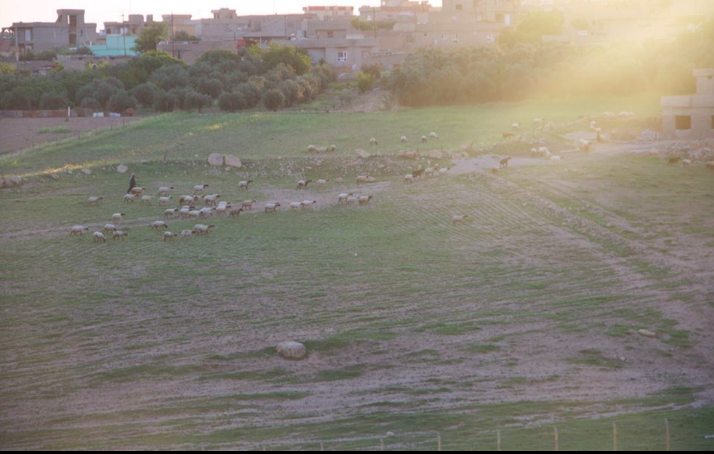 Another important facet of the Yezidi faith is their belief in the oneness with nature. They worship the Sun God , three to five times each day. 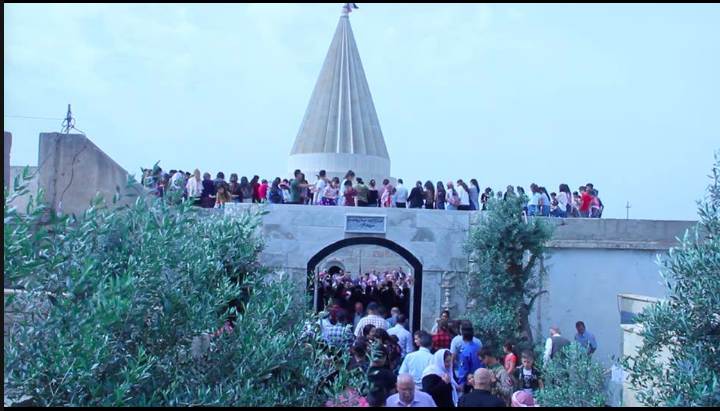 When Yezidis pray they face the sun. The Sun represents the source of energy or ultimate truth. It is sacred and seen as the emanation of God. Yezidi accounts of creation differ from that of Judaism, Christianity and Islam. They believe that God first created Tawûsê Melek from his own (God’s) illumination (Ronahî) and the other six archangels were created later. God ordered Tawûsê Melek not to bow to other beings. Then God created the other archangels and ordered them to bring him dust (Ax) from the Earth (Erd) and build the body of Adam. Then God gave life to Adam from his own breath and instructed all archangels to bow to Adam. The archangels obeyed except for Tawûsê Melek. In answer to God, Tawûsê Melek replied, “How can I submit to another being! I am from your illumination while Adam is made of dust.” Then God praised him and made him the leader of all angels and his deputy on the Earth. Hence the Yezidis believe that Tawûsê Melek is the representative of God on the face of the Earth and comes down to the Earth on the first Wednesday of Nisan (April). 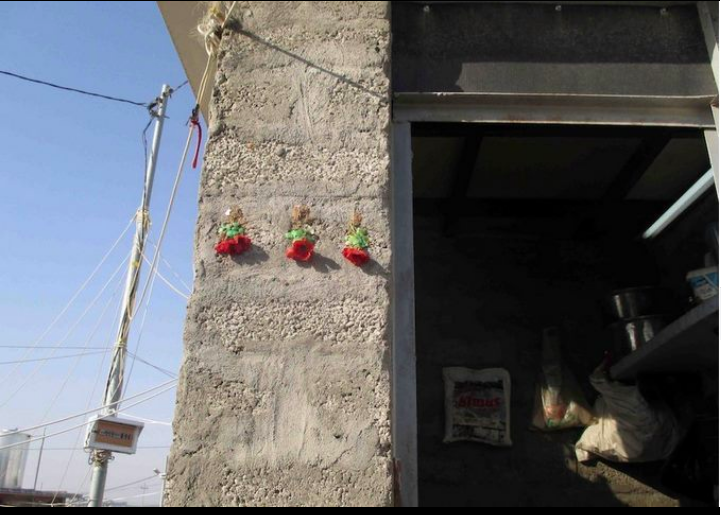 Yezidis hold that God created Tawûsê Melek on this day, and celebrate it as New Year’s Day. Yezidis argue that the order to bow to Adam was only a test for Tawûsê Melek, since if God commands anything then it must happen. (Bibe, dibe). In other words, God could have made him submit to Adam, but gave Tawûsê Melek the choice as a test. They believe that their respect and praise for Tawûsê Melek is a way to acknowledge his majestic and sublime nature. This idea is called “Knowledge of the Sublime” (Zanista Ciwaniyê). One of the key creation beliefs held by Yazidis is that they are the descendants of Adam through his son Shehid bin Jer rather than Eve. The real core texts of the religion that exist today are the hymns known as qawls; they have also been orally transmitted during most of their history, but are now being collected with the assent of the community, effectively transforming Yezidism into a scriptural religion. The Tomb of Sheikh Adi in Lalish Lalish is the spiritual heartland of the Yezidis, a place where they find both spiritual solace and physical protection during times of invasion and persecution.. During the recent assaults on the Yezidis by Saddam Hussien and the Kurdish Muslims many Yezidis sought short and long-term refuge in Lalish. The sacred history of Lalish begins with the arrival of the Yezidis’ patron deity Tawsi Melek, the Peacock Angel, who first arrived on Earth when the planet was still barren and constantly besieged by earthquakes and volcanoes, Tawsi Melek was sent to Earth to remedy the situation and make the planet one of the most beautiful in the universe. Landing as a peacock at Lalish, Tawsi Melek succeeded in stopping the Earth’s quaking and then he covered the planet with his “rainbow” peacock colors. 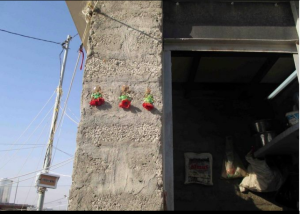 It is believed that during the sacred Autumn festival in Lalish Tawsi Melek still visits the place along with six Great Angels of the Yezidis. 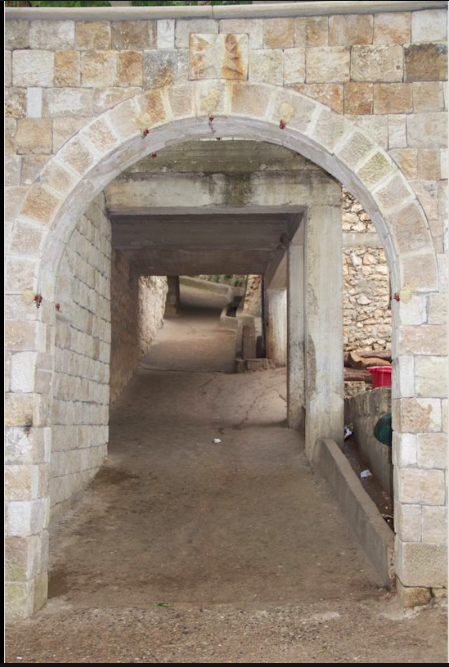 The focal point of Lalish is the Sanctuary, the shrine-tomb of the great Yezidi reformer Sheikh Adi. 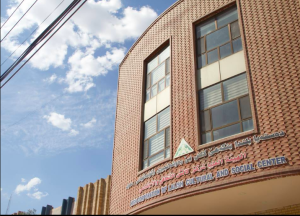 There are also tombs here dedicated to six of the Great Angels who took incarnation with Sheikh Adi, as well as shrines associated with the miracles of Sheikh Adi and landmarks that were, supposedly, once at Mecca, such as Mount Arafat. Legends state that Sheikh Adi transferred Mecca’s landmarks to Lalish, thus making it the most sacred power spot on Earth. There is also a guesthouse attached to the Sanctuary to house the most distinguished Shiekh families during the sacred festivals at Lalish. Known as the Mala Fagra or “House of the Faqir,” it is here that head of the order of Faqirs lives year round. The Faqir head is entitled to the revenue of alms collected from the pilgrims who visit the Sanctuary, a right he annually purchases from the Yezidi Prince. As one steps through the front entrance of the Sanctuary he or she is greeted by the image of a large black snake. According to one legend, this snake was once a live serpent. 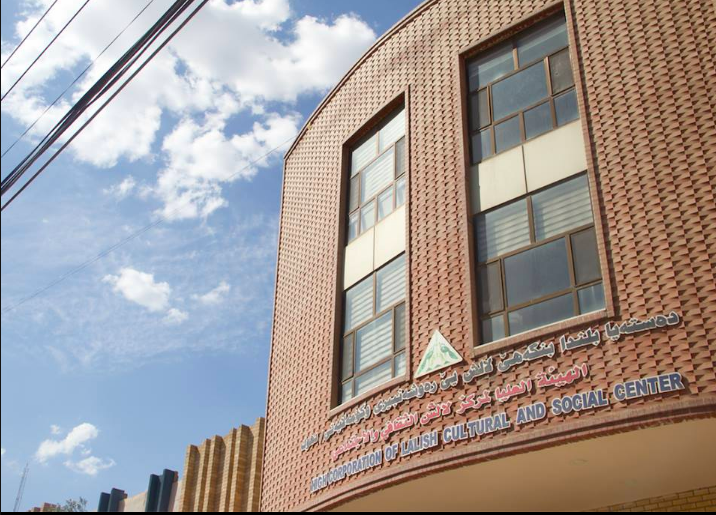 It was apparently causing problems for the residents of the Sanctuary so Sheikh Adi transformed it into a solid image when it attempted to scale the wall it is now attached to. Another legend states that Shiekh Mend, a companion of Shiekh Adi and an earthly manifestation of one of the Seven Great Angels, turned himself into this black snake and drove back the tribe of Haweris when they were attempting to convert the Yezidis to Islam. After stepping through main door of the Sanctuary one finds a dark pool of water to the right. This is the Lake of Azreal, the Angel of Death. Some Yezidis contend that Azreal washes his sword in this pool after taking a soul, while others claim that this is where Azreal brings the souls of the dead to be judged. According to tradition, Sheikh Adi is one of the principal judges of deceased souls. Yezidi communities can now be found in many countries around the globe, including large communities in Germany, Canada and the United States. Their principal cities, however, continue to remain in northern Iraq, Iran, Turkey, Syria, Armenia and other countries of the former Soviet Union. 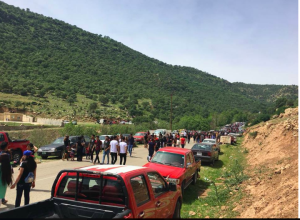 Most of the Yezidis in the Middle East dwell in five districts: (1) Sheikhan, the most important, to the northeast of Mosul in northern Iraq; (2) Jabal Sinjar, near the Syrian border, 100 kilometers due west of Mosul; (3) Halitiyeh, in the province of Diyarbakïr (southeastern Turkey); (4) Malliyah, to the west of the Euphrates, including Aleppo; (5) Sarahdar, the Yezidi settlements in the Caucasus region. The vast majority of Yezidis in the former USSR live in Armenia and Georgia. Urban centers with significant Yezidi populations include Leninakan, Etchmiadzin, and Tbilisi. There are also communities in Aparan and Talin (Armenia) and Lachin and Kelbajar (western Azerbaijan). There are a few small communities in Turkmenistan, which arrived with Kurds from Iran in the twentieth century. Most Yezidis in Iraq live in either the Sheikhan or Sinjar regions. Sheikhan, the “Land of Sheikhs,” is the Yezidi heartland, and includes within its borders Lalish, Baadra, the ancient seat of Yezidi Princes, and Eyn Sifni, the current residence of the Mir and the Baba Sheikh. The Sinjar Mountains are hot, sun-baked regions, where mostly Yezidi herdsmen live. Because of their severity and remoteness, the Sinjar Mountains have been both a buffer and refuge for Yezidis against their invaders. Yezidis began arriving in the United States in the 1990s and currently have small settlements principally in the Mid-West and the East. Their largest settlement is currently in the city of Lincoln, Nebraska. There are small communities in London, Ontario and Saskatchewan as well. Sheikh Adî is a divine being who resides in the same heaven as TM. After he took physical form so did all the seven angels except TM. Shaeikh Adî ibn Mustafa who is said to be of Umayyad descent from the Beka’a Valley of Lebanon. He settled in the valley of Lalişh (some thirty-six miles north-east of Mosul) in the early 12th century AD. Shaeikh Adî himself, a figure of undoubted orthodoxy, enjoyed widespread influence. He died in 1162, and his tomb at Lalish is a focal point of Yezidi pilgrimage. During the fourteenth century, important Kurdish tribes whose sphere of influence stretched well into what is now Turkey (including, for a period, the rulers of the principality of Jazira) are cited in historical sources as Yezidi. Sheike Adi determined that Yezidi can not convert to another religion and a person from another religion can not become Yezidi. There were those who wanted to become Yezidi and cause trouble within the religion. Sheikh Adi created the priest class. He created the Faquir class within the priest class. There is some desultory information of Shaikh ‘Adi and his teaching in the religious canticles. Thus, in the Prayer and Confession in the Yezidi Religion, the Yezidi name of the Shaikh is mentioned four times: ‘Bread is from Shaikh ‘Adi’s storehouse’; ‘Shaikh ‘Adi sits on the throne’; ‘My religion is [from] Sharf ad-Din’ (one of the components of his complete name); and ‘ Shaikh ‘Adi is the One God’. The Yezidi (Yazidi) cosmology and religion is non-dual. They thus acknowledge an inactive, static and transcendental God who created, or “became”, Seven Great Angels, the leader of which was Tawsi Melek, the Peacock “King” or Peacock “Angel”. Leading up to the creation of the cosmos, many Yezidis believe that the Supreme God was originally “over the seas”, a notion reminiscent of the Biblical passage: “And the Spirit of God (as seven Elohim) moved upon the face of the waters.” While playing with a white pearl, state the Yezidis, their Supreme God cast it into this cosmic sea. The pearl was broken and served as the substance from which the Earth and other planets and stars came into being. The Supreme God then created or manifested a vehicle for completing the creation of the universe. This was the first and greatest angel, Tawsi Melek, the Peacock Angel. Since Tawsi Melek embodied the power and wisdom of the Supreme God he was easily able to know and carry out His bidding. Six more Great Angels were then created to assist Tawsi Melek in his work. Soon after the Earth was created it began to shake violently. Tawsi Melek was then dispatched to Earth to stop the planet’s quaking, as well as to endow it with beauty and abundance. When Tawsi Melek descended to Earth, he assumed the form of a glorious peacock – a bird full of the seven primary and secondary colors. Landing in a place now known as Lalish, Tawsi Melek transferred his peacock colors to the Earth and endowed it with a rich flora and fauna. Tawsi Melek then traveled to the Garden of Eden to meet Adam. The first human had been created without a soul, so Tawsi Melek blew the breath of life into him. He then turned Adam towards the Sun, symbol of the Supreme Creator, while stating that there was something greater than a human being and it should be worshipped regularly. Tawsi Melek then chanted a prayer for all humanity to daily repeat to the Creator, and he did so in the 72 languages that were going to be eventually spoken by the 72 countries and races that were destined to cover the Earth. Then Eve was created. But according to the Yezidis before copulating the primal couple enrolled in a kind of competition to see if either of either of them could bring forth progeny independent of the other. They both stored their seed in a sealed jar and then after an incubation period opened them. Eve’s jar was opened and found to be full of insects and vermin, while inside Adam’s jar was a beautiful boy-child. This lovely child, known as Shehid bin Jer, “Son of Jar,” grew quickly, married, and had offspring. His descendants are the Yezidis. Thus, the Yezidis regard themselves descendants of Adam but not Eve. Shehid bin Jer inherited the divine wisdom that Tawsi Melek had taught his father Adam and then passed it down to his offspring, the earliest Yezidis. It is this wisdom that has become the foundation of the Yezidi religion. According to the Yezidis, the Garden of Eden era corresponds to a Golden Age of wisdom and prosperity that once covered the planet. After this time of great spiritual light humankind increasingly resorted to self-serving behavior and darkness set in. A series of floods were then released to cleanse the Earth, the most recent of which occurred about 6,000 years ago. The Yezidi trace the crystallization of their religion into its present form back to this period 6,000 years ago. Following the last flood the Yezidis moved from the homeland in Northern Iraq to India, Afghanistan, and North Africa. Then about 4,000 years ago many of them began to return home. Once back in Northern Iraq the Yezidis help create and participate in the Sumerian, Babylonian and Assyrian civilizations. In the 11th century CE the Yezidi culture was reformed by the great Sufi, Sheikh Adi, who oversaw the final modifications that shaped the Yezidi religion down until the present time. Under the unseen guidance of Tawsi Melek, Sheikh Adi composed a scripture, taught hymns and prayers and established the current Yezidi caste system. Shiekh Adi was entombed in Lalish, the ancient spot where the Peacock Angel first landed, making it the spiritual heartland of the Yezidis. The Mîr is the temporal and religious head of the Yezidis. He represents his people at all national and international conferences. The role of Mîr is hereditary and currently drawn from one of the Sheikh families, known as the Çol family. This man and his eventual descendents assume the title of Mîr and are the royal family. 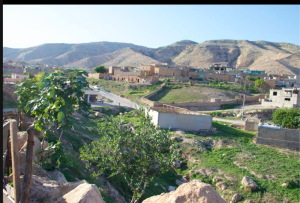 Initially they were given as their palatial seat the village of Baadra in the Sheikhan region of the Yezidis, but they currently reside in the Sheikhan town of Eyn Sifni. Like the Mîr, the Baba Shiekh also hails from the Shiekh caste and currently resides in the town of Eyn Sifni. Technically, the Baba Sheikh, meaning “Father” Sheikh, is the spiritual head of the Yezidis and the Mîr is the temporal head of the tribe, however in practice the Baba Shiekh remains subordinate to the Mîr in both temporal and spiritual matters. The Baba Sheikh is traditionally present at all important religious meetings and ceremonies of the Yezidis, especially those conducted at Lalish. Once a year the Baba Sheikh visits all the Yezidi villages to give his blessings and conduct ceremonies. During these visits he also resolves disputes among the villagers. Tawsi Melek, the “Peacock Angel” and “Peacock King,” is the most import deity of the Yezidis. But he is not just the possession of the Yezidis, he belongs to the entire world. The Yezidis believe that they possess the oldest religion on Earth, the primeval faith that features Tawsi Melek, and that all other traditions are related to them through the Peacock Angel. They contend that Tawsi Melek is the true creator and ruler of the universe, and therefore a part of all religious traditions. He does not, however, always manifest within these diverse traditions as a peacock. Tawsi Melek has taken on many other forms throughout time. Tawsi Melek was the first to emerge from the Light of God in the form of a seven-rayed rainbow, which is a form he still today continues to manifest within to them (usually as a rainbow around the Sun). But the Yezidis also claim that Tawsi Melek and the six Great Angels are collectively the seven colors of the rainbow. Therefore, the six Great Angels were originally part of Tawsi Melek, the primal rainbow emanation, who bifurcated to become the rainbow’s seven colors, which are collectively the Seven Great Angels. Of the seven colors produced from the primal rainbow, Tawsi Melek became associated with the color blue, because this is the color of the sky and the heavens, which is the source of all colors. “The first day which He (the Supreme God) created was Sunday. On that day He created an angel whose name was ‘Azra’il. This is Melekê Taus, who is the greatest of all. On Monday He created the Angel Darda’il, who is Shaikh Hasan. On Tuesday He created the Angel Israfil, who is Shaikh Shams. On Wednesday He created the Angel Mika’il, who is Shaikh Abu Bakr. On Thursday He created the Angel Gibra’il, who is Sagad ad-Din. On Friday He created the Angel Shimna’il, who is Nasir ad-Din. On Saturday He created the Angel Nura’il, who is Yadin [Fakhr ad-Din]. Ever since their primal creation the Seven Great Angels have been associated with the day of the week they were created. Tawsi Melek’s day is Sunday, etc. Once the Seven Great Angels were created the Earth was produced by them out of the substratum of the original pearl. It remained barren and then suddenly entered a phase of intense continual shaking, perhaps coinciding with the violent earthquake and volcanic activity that was ubiquitous around the young Earth. In order to calm the planetary quaking, the Supreme God sent the Peacock Angel to Earth with orders to both sedate the Earth and endow it with multi-colored flora and fauna. As Tawsi Melek descended into the physical dimension his seven-colored rainbow self became manifest as a magnificent bird of seven colors, the peacock. He then flew around the globe in order to bless every part of it, finally landing in the area of what is now Lalish, the Yezidis most sacred part of Earth located in northern Iraq. Here Tawsi Melek was able to calm the Earth while simultaneously covering it with his peacock colors. With the Earth in a more placid phase of its evolution the Great Angels proceeded to their next creation, Adam. The first human was created by all the Seven Great Angels, each of whom endowed him with a physical sense to experience life. One gave him an ear, one a nose, one a mouth, etc. But the first human was a lifeless heap without a soul, so Tawsi Melek transmitted the breath of life into him. When Adam then rose to his feet, Tawsi Melek quickly swung him around so that he was facing the Sun while informing him that there was something much greater than he and that praying daily to the Sun as a form of the Supreme God would help him to remember this truth. Tawsi Melek then verbalized the prayers that Adam and his descendants around the globe were to repeat during their worship, and he spoke them in 72 languages since Adam and Eve were destined to have 72 sons and 72 daughters who would populate the 72 regions or countries of the Earth. The Peacock Angel then informed Adam that if he and his descendants remained steadfast in righteousness they would eventually see and know the Supreme God personally. In the meantime, Tawsi Melek would be their protector and teacher even while residing in another dimension. YI Journey to Ancestral land. . .
On Monday, April 11th, 2018 some of our members met with Pir Khedr Sulyman who is one of the forefront Yezidi scholars. 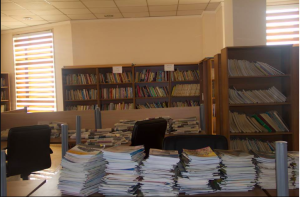 He and couple of his friends were the first Yezidis in Iraq to publish work on the religion and have the Yezidis qewls or hymns commit to writing. 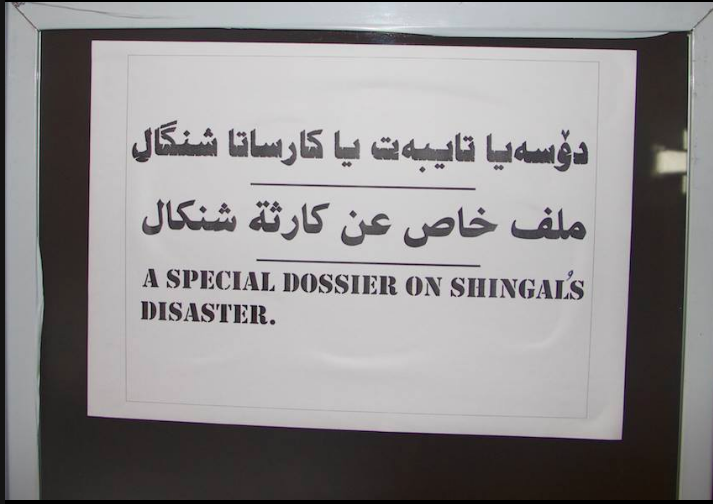 Interest in Yezidism which had died away for decades became renewed thanks to their effort. 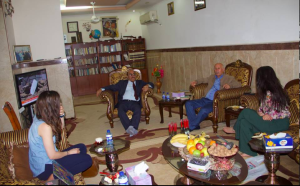 Pir Khedr accompanied YI members to the Yezidi Cultural Center which he use to preside over years ago. The center had an extensive collection of books, videos, and other media related to Yezidi history, religion, and culture. Our team asked about the possibility of having part of their collection become available on the net so that more people could have accesses to it. 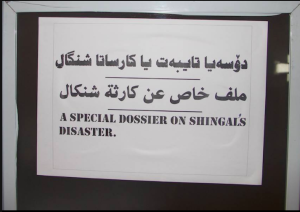 just as bahzani.net has done. They week before they also had an opportunity to meet with another Yezidi scholar, Dawood Murad Khatari. He too has devoted a better part of his life to serving Yezidis by writing about the culture and religion and helping make sense of it. He has so far written 28 books on Yezidism. 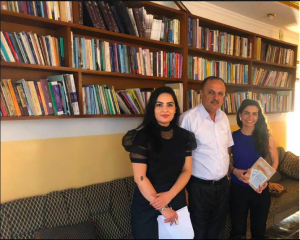 Our team collected much information about the Yezidi heritage from these meetings and hope to later have it published and make available to the public. 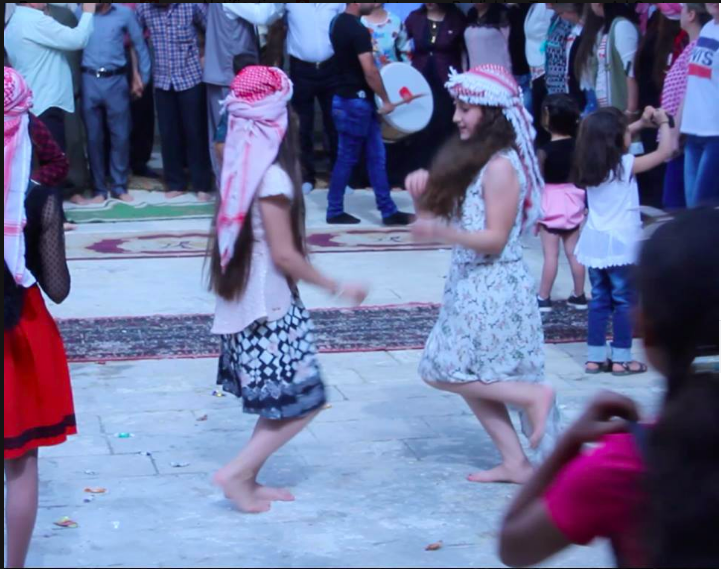 Why Yezidis chose Sinjar mountains as a safe haven in middle of summer. 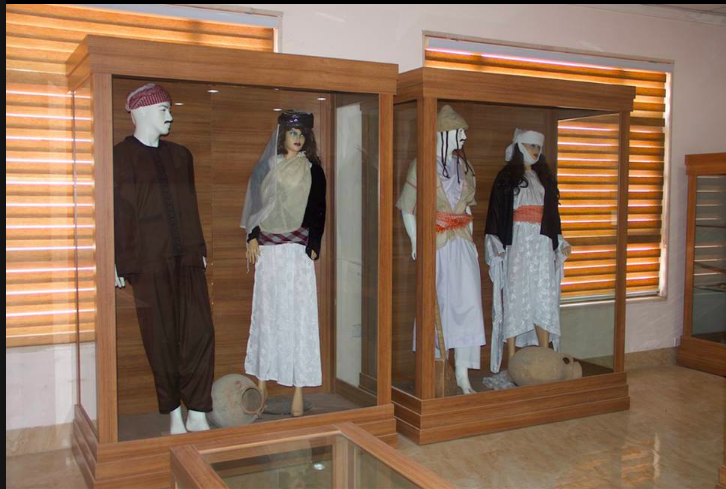 Yezidis International’s Journey to Ancestral Land. For Yezidis, if we think about it, it is earth day everyday of April. -Charshama Sari Sali holiday takes place on third Wednesday in April, which fell on April 18th this year. -This holiday is meant to commemorate the creation of the universe and celebrate nature and fertility. -on this holiday, eggs are used to commemorate the creation of our universe. -they are boiled to symbolize earth solidification with the coming of Lalish. 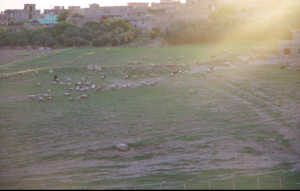 -In old days, no Yezidi would plow the land. it was sinful. They would watch the world spring to life with vegetation and new life and allow the world to be. Today trip was to Boza (AKA Bozan). 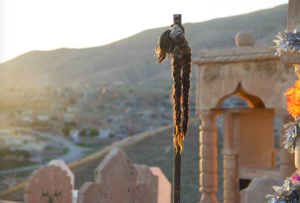 It is one of the oldest Yezidi villages and at one point was being considered for becoming the Yezidis’ holiest site. As such, it is sometimes called “Small Lalish”. There is still so much more to experience and learn about. Look through the pictures to learn more. Braids cut off and hang from one of the tombs at Boza cemetery. Traditionally, Yezidi girls and women didn’t cut hair unless a loved one passed away. Yezidis International’s Journey to Ancestral Land . . .
Yezidis have been called children of the sun because of their high reverence for the sun. The way they bury their dead is reflective of their regard for the sun.